I loved the series to begin with, and I appreciate Naughty Dog’s technical skills, but I really went off it over time and 3’s dreadful storytelling pretty much killed my interest. (That was one reason The Last of Us impressed me so much.) So the cutscenes are finally real-time now? Took them long enough. I think I’ll post a video of it, just a short one, to demonstrate the water particle physics on the windshield that react to the car speed/wind on the car and the wipers, it’s really quite something. I can imagine ploughing through mud and heavy rain with some truck, listening to hard rock tunes. Yoshida was talkingabout Morpheus and an unnannounced “fast paced” game that would keep “core gamers” entertained for a long time. I can only think of one thing I want it to be. **VR Wipeout. **​Collectors edition comes with reusable puke bucket. 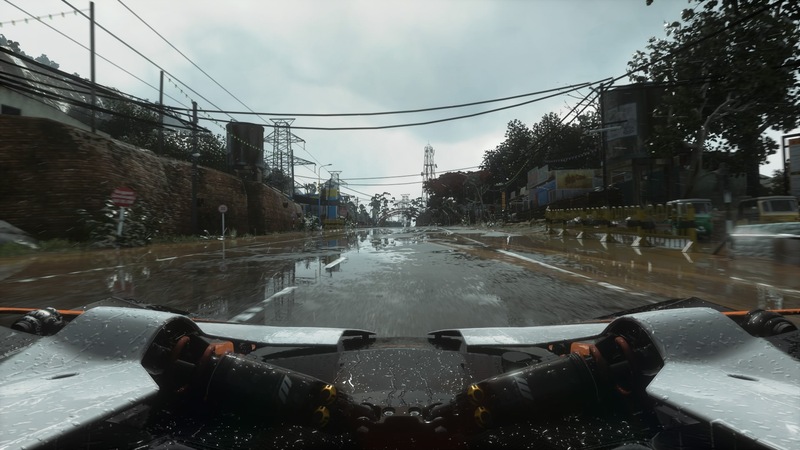 Raindrops are distractingly big, but otherwise, yes, Driveclub is astonishingly good-looking. Reviews make it seem like it’s not really my sort of racing game but I still can’t help but feel a little jealous. Though speaking of puking, after the atrocious camera for the bikes in the original Motorstorm I can die a happy man knowing I’ll never play one of those games again (if the series is actually still going). Briefly back to Uncharted to answer (somewhat) the question of real-time cutscenes. Long answer: the video is an incredible view into how complicated the model for Drake has gotten, from normal maps to estimate wrinkling, eyes moving to deform the eyelids and skin above it accurately, to the material-based/physics based lighting being used, incredibly more robust facial expressions, to cloth physics of the shirt, and that the same model being used in cutscenes and gameplay. Motorstorm’s last games were RC for Vita, Artic Edge on PSP and PS2 (a cult favourite apparently), and Apocalypse on PS3 (delayed due to concerns of sensitivity for the earthquakes in Tokyo). And lastly as an aside: some B-roll footage (basically means unedited as far as I understand) 15 minutes long or some such of Order gameplay, just about to watch it now. I’m not really interested in sitting through those videos given I’ll probably never own a PS4. I’m not *that *invested in what Naughty Dog can or can’t do. I was just mildly curious - it always bugged me a little switching from real-time to pre-rendered in Uncharted or The Last of Us and if Ubisoft could get close with Unity (real-time but cutscene-only detail), I would have thought Naughty Dog could get pretty much all the way - PS4 may not be as powerful as a high-end PC but I’d imagine they know Sony’s hardware better than Ubisoft do. But again, I doubt I’ll ever play it, so unless they come out and clearly state it in an interview or press release I can happily live in ignorance. It wasn’t in response to you alone, I happened to start the video and end up watching the whole thing. I still recommend watching even though it is an hour, to anyone, it’s very basic level that anyone can understand, but also illustrates many new features of shading and art in character design, it’s a very good video. Also again a lot of visual examples of the features they talk about over the whole video. Just an interesting talk for those interested. It is not a question of whether or not ND is capable of doing a great looking, better looking, realtime render for cutscenes. That is definite that they can, and definite that they would do better. We don’t even know for sure if the cutscene at the end of the PS Experience gameplay was real-time or not. It’s just up to them whether they decide to be limited by the realtime render capability, or use even more robust lighting techniques that just aren’t appropriate for realtime on PS4 or even on PC. This is keeping in mind at E3 2014 that Corrine Yu (using twitter) reported that Uncharted 4 trailer for E3 2014 was completely realtime on PS4 hardware. Then other unofficial reports came around that Uncharted would be only doing realtime cutscenes (never confirmed 100%). Since that was back in June, and also not 100% confirmed even (outside of the trailer itself from E3) I do not want to say if that is the case (that all cutscenes will be realtime). Best demo of the game so far I think, looks really cool. Some cool design as well, that if a character dies they just die and the game moves on and fits it into the story. Like a TWD in gameplay, adventure style, but a lot more creative use of controls, like motion controls on the DS4 to stay still (very accurate and responsive sensor in this one). wow nice games trailers! Anyways has anyone else heard about PS4NetworkRewards giving saway a free PS4? My friend got a email after he submit his email, can someone tell me if this contest is fake or real? Some updates for Uncharted after GI has put it as it’s cover game. GI saw an extended demo with a new scene. Drake is beaten down while Sam is rested, they start arguing the existance of Avery secret, then something catches Drake’s eye, he moves forward, pull some foliage, revealing a gray monument with a carving. -There are 60 different animations just of Drake picking up objects. -You can attack enemies from all sides with unique animations to them, you wont magically warp in front of them if you -punch. -Lots of talk from Druckman on the cost of adventuring on Drake’s life, it will be a major focus of the story. Compares his addiction to treasure hunting to a drug addict. -All the new items they added were chosen cause it can help keep the pacing and gives you a better sense of exploration and adventure. -They said the large puzzle rooms from Uncharted 3 will still be there, they say U3 had the best puzzles of the series and they want to build on that. -TLOU moments where the characters react to what they see or read will happen in this game. Also Infamous First Light (PS4), Swapper (PS4/PS3/Vita), Duke Nukem 3D Megaton (PS3/Vita), and Duck Tales Remastered (PS3) are most of the PS Plus releases for this month. This seems like the most important item. ND’s going to get the story, character, and dialogue right. They make cinematic games and they know what they’re doing. I LOVED U2, but really didn’t care for U3 that much because it just felt like I was pushing Drake through a series of pre-defined set-pieces. I wasn’t a participant; Drake’s path was determined and I was just the guy pushing him down it. I’m not sure why U3 felt more like that than U2 or TLoU (since they’re all similar as far as gameplay goes), but hopefully this focus on navigational freedom will help alleviate it. This isn’t really news (unless you count it as news about a playstation 4 (mine)), so apologies if this isn’t the right place. So, I finally took the plunge and bought a PS4, which was made less less painful wallet-wise by using some money I just got for being at my work for 10 years. I’ve never really gone in for the online/social aspects of console gaming before, but this thing seems built for that. So if anyone wants to take some pity on a relative newbie, and add me as a friend on there, it would be appreciated Username is the same as my name on here. Also, any suggestions of what is worth playing in your experienced opinions, as I have a bit of money left to get some games? I feel the exact opposite to those games. It seems to be like an excellent graphic engine demonstration then a game. I mean, the graphics is stunning, but there isn’t much gameplay to speak of. It’s more like a graphic novel or interactive movie. That’s what games like Cryostasis gave me after around 1 hour of gameplay. And it seems only Sony welcome these “games”. There are not many of these around on Microsoft or Nintendo platforms. Nintendo haven’t made anything original for about as long as I can remember. And there’s no problem with games that are more of an interactive movie or a graphic novel, so long as they’re sold like that and Until Dawn is 100% being marketed as that. I think it’s just that U3 was very confusing in direction of the story and why Drake was going to some places. IIRC Naughty Dog decided on making certain setpieces with the game over making a more tight story, for better or worse.